Canadian iPhone and iPod Touch users will be able to celebrate all 9’s day (today is 09-09-09) by participating in Skype conversations from their iPhone. 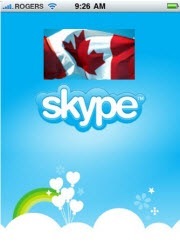 At 12:01 a.m. the Canadian Apple App store will be making Skype for iPhone available. Breaking news (12:04 a.m. Sept. 9): I have just successfully downloaded Skype for iPhone from the Canadian Apple App store and sent my first chat message to the Skype 5.x Public Chat session. When Canadians woke up on the March 31 worldwide launch date of Skype for iPhone they learned they could not be amongst the over 6 million iPhone users who have since downloaded Skype for iPhone from Apple App stores worldwide, except, of course, in Canada. A shock to the country where Alexander Graham Bell made the world’s first long distance call to Brantford, Ontario across a six kilometre wire from a nearby telegraph station back in 1876. The Canadian launch of the Skype for iPhone was delayed while Skype and Apple Canada’s licensing teams worked out “ambiguity” issues related to Skype for iPhone’s use of the G729 codec in Canada. In an interview with Skype personnel yesterday I was advised these issues are now resolved with the Canadian launch set for 12:01 a.m. Sept. 9, 2009 when they will be able to download the recently released Skype for iPhone 1.2. Where can it be used: All Skype for iPhone features are available at any WiFi access point on both the iPhone and iPod Touch; however, when an iPhone is on a 3G wireless carrier the voice application is not available to be in compliance with the terms of Apple’s Software Development Kit licensing agreement. However, chat and presence activity can continue over a 3G carrier’s network. Call Forwarding: (new in version 1.2) when the Skype for iPhone is not open on the iPhone, calls will be forwarded to the iPhone’s mobile number under the same terms as calls to landline or mobile phones. How useful is Skype for iPhone? when I was at a business meeting in Spain in early July, I found two North Americans using their Skype for iPhone as a “walkie-talkie” to communicate with each other while on the hotel property using its WiFi connection. Neat actually. With the rapid spread of WiFi access points as an alternative to using wireless carriers iPhone users should find many public and private (home, office) locations where they can use Skype for iPhone. 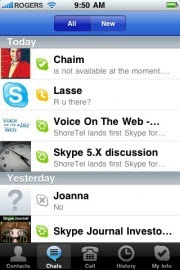 Skype for iPhone suffers from one limitation of the iPhone: the lack of background processing. You must have the application open, not only to send and receive voice calls, but also to follow chat sessions. Hopefully the previously announced Skype for BlackBerry will address this issue where the BlackBerry supports background processing. Bottom line: with Skype chat as over 80% of my Skype activity I look forward to being able to track chat sessions while riding buses and commuter trains (but not while driving a vehicle – text messaging while driving becomes illegal in Ontario this month). And making Skype voice calls from my home as well as hotels, restaurants and other myriad of locations with a WiFi access point. P.S. – Is it coincidence that Skype for iPhone became legally available to Canadians so soon after the announcement that 17 million Canadians will have a shareholder interest in Skype? Probably not. CBC.ca: Skype finally hits iPhones in Canada includes a more detailed discussion about the licensing issue.